Subtelomeric 1q43q44 microdeletions cause a syndrome associating intellectual disability, microcephaly, seizures and anomalies of the corpus callosum. Despite several previous studies assessing genotype-phenotype correlations, the contribution of genes located in this region to the specific features of this syndrome remains uncertain. Among those, three genes, AKT3, HNRNPU and ZBTB18 are highly expressed in the brain and point mutations in these genes have been recently identified in children with neurodevelopmental phenotypes. In this study, we report the clinical and molecular data from 17 patients with 1q43q44 microdeletions, four with ZBTB18 mutations and seven with HNRNPU mutations, and review additional data from 37 previously published patients with 1q43q44 microdeletions. We compare clinical data of patients with 1q43q44 microdeletions with those of patients with point mutations in HNRNPU and ZBTB18 to assess the contribution of each gene as well as the possibility of epistasis between genes. Our study demonstrates that AKT3 haploinsufficiency is the main driver for microcephaly, whereas HNRNPU alteration mostly drives epilepsy and determines the degree of intellectual disability. ZBTB18 deletions or mutations are associated with variable corpus callosum anomalies with an incomplete penetrance. ZBTB18 may also contribute to microcephaly and HNRNPU to thin corpus callosum, but with a lower penetrance. Co-deletion of contiguous genes has additive effects. Our results confirm and refine the complex genotype-phenotype correlations existing in the 1qter microdeletion syndrome and define more precisely the neurodevelopmental phenotypes associated with genetic alterations of AKT3, ZBTB18 and HNRNPU in humans. The online version of this article (doi: 10.1007/s00439-017-1772-0) contains supplementary material, which is available to authorized users. Deletion of the subtelomeric region of the long arm of chromosome 1 (1q43q44 or 1qter microdeletion syndrome) is associated with a complex neurological phenotype, including moderate to severe intellectual disability (ID), microcephaly, epilepsy and anomalies of the corpus callosum (AnCC). More than 40 patients with 1q43q44 microdeletions of variable sizes identified by chromosome microarray have been reported. Comparison of their clinical phenotypes has established some genotype-phenotype correlations and has identified three genes, preferentially expressed in the brain and located in a genomic region spanning 1.36 Mb (between the hg19 genomic coordinates 243,663,021 and 245,027,827), as the main genes contributing to the 1qter microdeletion phenotype: AKT3 is the main candidate for microcephaly, ZBTB18 for AnCC and HNRNPU for epilepsy (Ballif et al. 2012; Nagamani et al. 2012; Thierry et al. 2012). However, these findings are subject to controversy depending on the study and further evidence supporting these hypotheses is therefore lacking. Interestingly, point mutations in AKT3, ZBTB18 and HNRNPU have recently been identified by whole exome sequencing in patients with different neurodevelopmental phenotypes. AKT3 encodes a serine/threonine protein kinase involved in the mammalian target of rapamycin (mTOR) signaling pathway. 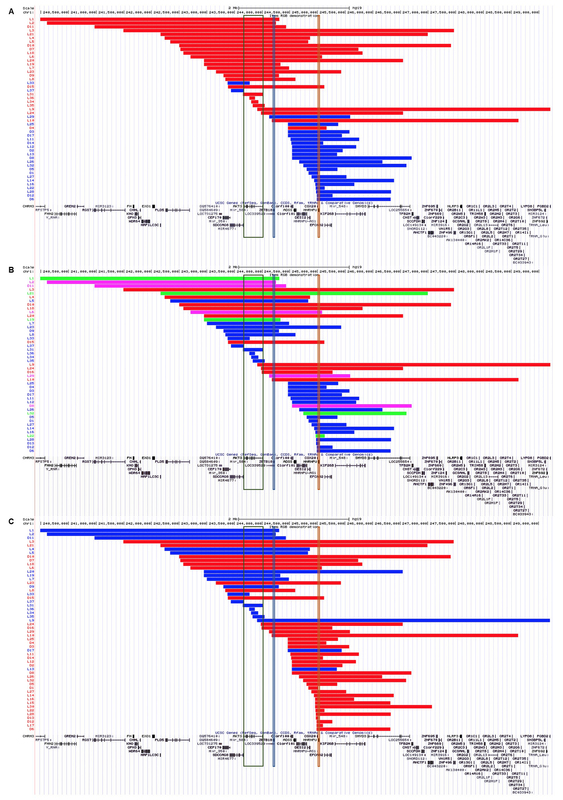 Gain-of-function point mutations or microduplications leading to abnormal AKT3 and mTOR activation, most of which are limited to somatic brain populations, cause a spectrum of disorders characterized by cerebral hemisphere overgrowth such as hemimegalencephaly (HME), megalencephaly-polymicrogyria-polydactyly-hydrocephalus (MPPH) and megalencephaly-capillary malformation (MCAP) (Lee et al. 2012; Mirzaa et al. 2013; Poduri et al. 2012; Riviere et al. 2012). Conversely, Akt3 −/− mice show a 20% reduction in brain size (Easton et al. 2005). ZBTB18 (also known as ZNF238 or RP58) encodes a C2H2-type zinc finger transcription factor negatively controlling the expression of genes involved in neuronal development, including cell division of progenitor cells and survival of postmitotic cortical neurons (Baubet et al. 2012; Heng et al. 2015; Xiang et al. 2012). Zbtb18-deficient mice show features reminiscent of the 1q43q44 microdeletion syndrome including microcephaly and agenesis of the corpus callosum (AgCC) (Xiang et al. 2012). Eight patients with de novo ZBTB18 mutations have been reported, including three with a normal corpus callosum (CC) (Cohen et al. 2016; de Munnik et al. 2014; Lopes et al. 2016; Rauch et al. 2012) and four with AnCC (Cohen et al. 2016). Finally, HNRNPU encodes the heterogeneous nuclear ribonucleoprotein (hnRNP) U, an abundant nucleoplasmic phosphoprotein able to bind pre-mRNA in vivo, possibly involved in pre-mRNA splicing (Roshon and Ruley 2005; Ye et al. 2015). Eighteen de novo and/or truncating mutations in HNRNPU mutations have been reported in ClinVar, Decipher and in different studies (Carvill et al. 2013; de Kovel et al. 2016; Epi4K Consortium et al. 2013; Hamdan et al. 2014; Monroe et al. 2016; Need et al. 2012; Zhu et al. 2015); however, since these mutations were reported each in separate studies and the phenotype of the patients was not described, a specific disorder related to HNRNPU mutations is not yet characterized. Although the description of these patients independently reinforced the previously proposed genotype–phenotype correlations, the dispersion of patients with point mutations in different studies and the absence of comparison with microdeletions did not permit to clearly address the clinical spectra associated with mutations in these genes, nor the possible epistatic or additive genetic interactions. The aim of this study was to describe in more details novel patients with HNRNPU and ZBTB18 point mutations identified by next generation sequencing and to compare their core phenotype with those of patients with 1q43q44 microdeletions to decipher the contribution of each gene to the 1qter microdeletion syndrome. To this aim, we collected and compared the data of 17 patients with 1q43-q44 deletions, four patients with ZBTB18 mutations and seven with HNRNPU mutations. We independently identified two ZBTB18 point mutations in unrelated patients with AnCC and one HNRNPU mutation in a patient with epileptic encephalopathy by, respectively, sequencing 423 genes associated with AnCC (callosome panel) in humans or mice (Mignot et al. 2016) or 4813 genes of the Trusight One panel (Illumina). We then collected clinical and molecular data of patients with ZBTB18 and HNRNPU mutations or 1q43q44 microdeletions through members of the EUROEPINOMICS RES consortium, the French Achropuce network (http://www.renapa.univ-montp1.fr/), Genematcher (Sobreira et al. 2015) and Decipher (https://decipher.sanger.ac.uk/) (Firth et al. 2009). This series includes previously reported patients with updated clinical data and previously reported genotypes with unreported clinical data: patients D2, D3, D4, D5 and D8 were reported as patients #7, #5, #3, #9 and #6, respectively, in (Thierry et al. 2012); patient H2 was reported as patient #15 in (Monroe et al. 2016); patient H3 was reported as patient 2012D06376 (de Kovel et al. ); the mutation identified in patient H7 was present in Decipher (ID 268181—DDD-NIG268181); deletions present in Decipher correspond to patients D9 (ID 2762), D13 (ID 332095), D14 (ID 275142), D15 (ID 268383), D16 (ID 253339) and D17 (ID 2926112). All other patients with deletions and point mutations are novel. In addition, we performed a review of the literature on 1q43q44 microdeletions and included microdeletions <6 Mb encompassing AKT3, ZBTB18 and/or HNRNPU with available breakpoints, excluding patients with other probably pathogenic chromosomic anomaly (numbered L1–L37: Ballif et al. 2012; Du et al. 2014; Gai et al. 2015; Gupta et al. 2014; Nagamani et al. 2012; Perlman et al. 2013; Thierry et al. 2012). Coordinates of the deletions reported in hg18 were converted into hg19/GRCh37 with LiftOver (https://genome.ucsc.edu/cgi-bin/hgLiftOver). Clinical data were collected using a standardized questionnaire directly from the referring clinicians. Microcephaly was considered for patients with an occipitofrontal circumference (OFC) of at least −2.5 standard deviation (SD) below the mean. A radiologist, a neuropediatrician and a geneticist collegially ascertained brain MRI anomalies. AgCC designates the absence of one or all parts of the CC, DysCC is used for complete CC with an abnormal shape or abnormally small CC, ThCC is used for complete CC with insufficient thickness. We retrieved the probability of loss-of-function (LoF) intolerance (pLI) calculated by the Exome Aggregation Consortium (ExAC) and the haploinsufficiency score (HI) established by Huang et al. (2010) for genes of the 1q43q44 region comprised between genomic positions 239,990,618 and 249,208,333 to determine genes intolerant to haploinsufficiency, contributing to 1qter deletion phenotypes (Table S1). The pLI calculates the probability that a gene is intolerant to LoF mutations, calculated from the difference between the number of LoF mutations observed in the 60,000 individuals present in ExAC and the theoretical number of expected LoF mutations in this gene in a population of same size if there was no selective constraint. Genes with a pLI ≥0.9 are considered to be significantly LoF intolerant. HI scores evaluate the probability that the gene is intolerant to haploinsufficiency, calculated from CNV data and integrating genomic, evolutionary and function properties of haploinsufficiency (Huang et al. 2010). High ranks (e.g. 0–10%) indicate a gene that is likely intolerant to haploinsufficient; low ranks (e.g. 90–100%) indicate a gene that likely tolerates haploinsufficiency. Missense variants were assessed in silico for possible pathogenicity using Alamut Visual 2.7 (Biointeractive Software, France), PolyPhen-2 (http://genetics.bwh.harvard.edu/pph2) and SIFT (http://sift.bii.a-star.edu.sg). We used UCSC (https://genome-euro.ucsc.edu) to align microdeletions on a schematic representation of the 1q chromosome. Alignments were performed using different colors explained in the figure legends. Minimal critical regions were defined as the smallest deleted region of overlap found in at least 95% (microcephaly and epilepsy) or 85% (AnCC) of patients harboring a given phenotypic trait. Frequencies were compared using the Fisher’s exact test. To decipher the contribution of genes located in 1qter region to the corresponding microdeletion syndrome, we collected clinical data from 17 patients with 1q43-q44 microdeletion (Table S2) and compiled them with those of 37 previously reported patients fulfilling our criteria (see Methods, Table S3). Altogether, the 54 deletions span a 10 Mb region comprising 83 genes, 39 of which encode clustered olfactive receptors (OR). Seven genes (RGS7, AKT3, ZBTB18, HNRNPU, KIF26B, CNST, AHCTF1) were predicted to be probably or possibly intolerant to haploinsufficiency among the 44 genes other than OR genes (Table S1). Among these genes, AKT3, ZBTB18 and HNRNPU are clearly those with the highest pLI scores and HI ranks as well as the highest expression in the brain (Table S1). We then decided to focus our study on these three genes that likely contribute to most clinical features of 1q43q44 microdeletion syndrome, as predicted from previous genotype-phenotype correlation studies. Specifically, 12 microdeletions encompassed AKT3, ZBTB18 and HNRNPU; six completely or partially included AKT3 but not ZBTB18 and HNRNPU; nine encompassed AKT3 and ZBTB18 but not HNRNPU, two ZBTB18 and HNRNPU but not AKT3, and 25 deleted HNRNPU but not AKT3 and ZBTB18 (Fig. S1). Out of the 49/54 patients with available OFC, 26 had microcephaly (red bars in Fig. S2A); 47/54 patients had available brain imaging: 20 had AnCC, including ten with agenesis (AgCC, red bars in Fig.S2B), five with dysgenesis (DysCC, pink bars in Fig.S2B) and five with thin corpus callosum (ThCC, green bars in Fig. S2B). Finally, 36/54 patients had epilepsy (red bars in Fig. S2C). The alignments of microdeletions found in patients with a known OFC and comparison of their gene content showed that microcephaly was present in all 20 patients with deletions encompassing both AKT3 and ZBTB18, regardless of the presence of HNRNPU in the deletions (Fig. 1a, b). Conversely, 20/21 patients with a deletion encompassing HNRNPU but sparing AKT3 and ZBTB18 had normal OFC (versus 2/15 when HNRNPU not deleted, p = 0.00086, Fisher’s exact test). AKT3 was included in 24/26 deletions identified in individuals with microcephaly, whereas only 2/23 patients with microdeletions sparing AKT3 had microcephaly (p = 1.46E −9). The number of patients with microcephaly who had deletions including ZBTB18 (n = 21/22) and sparing ZBTB18 (5/27) was also significantly different (p = 4.25E −8). Four of the six deletions including coding sequences of AKT3 only and one of the two deletions encompassing ZBTB18 but not AKT3 were associated with microcephaly. The minimal critical region for microcephaly (g.243,778,438–g.244,125,269) mapped to a region encompassing the 5′ upstream region and the five first exons of AKT3 (Figs. 1a, 2a). Altogether, these results indicate that (1) AKT3 is the main driver for microcephaly in the 1q43q44 region; (2) ZBTB18 haploinsufficiency may independently lead to microcephaly with a lower penetrance; and (3) co-deletion of AKT3 and ZBTB18, which are neighboring genes spaced from only ~200 Kb, may have an addictive effect, resulting in constant microcephaly. Considering all types of AnCC, the alignment of deletions revealed that, contrary to microcephaly, AKT3 deletion was not significantly associated with AnCC. More precisely, 11/26 patients with AKT3 deletion versus 16/21 without AKT3 deletion had a normal CC (p = 0.06). Accordingly, all six patients with a microdeletion involving only AKT3 had a normal CC. The proportions of patients with AnCC who had deletions encompassing (17/32) or sparing HNRNPU (5/15) were also not significantly different (p = 0.23). In contrast, the number of patients with AnCC was significantly higher in cases of deletions containing ZBTB18 (17/22) compared with deletions sparing this gene (3/25, p = 6.84E −6, Fig. 1c, d). Accordingly, the minimal critical region for AnCC overlaps ZBTB18 (Fig. 1c). When comparing patients with ZBTB18 deletions sparing HNRNPU versus deletions encompassing both genes, the proportions of AnCC as a whole were not significantly different (5/9 vs 12/13, respectively; Fig. S3). However, these proportions reached statistical significance when considering AgCC instead of AnCC (p = 0.01). These results suggest that (1) the main driver for AnCC, and more particularly AgCC, in the 1q region is ZBTB18, although with incomplete penetrance, (2) HNRNPU haploinsufficiency can be associated with ThCC, and (3) deletion of both ZBTB18 and HNRNPU, which are 792 kb distant, has an additive effect, resulting in more penetrant AnCC phenotype and more frequent AgCC. Deletions identified in epileptic patients showed a shift toward the telomeric extremity of the 1q region (Fig. S2). Of the 36 patients with epilepsy, 35 had a deletion including HNRNPU and only one had a deletion sparing HNRNPU (p = 1.28E −8, Fig. 1e, f). The minimal critical region for epilepsy was narrow and included HNRNPU and COX20, which is a gene that tolerates haploinsufficiency. Comparison of the number of epileptic patients who had AKT3 deleted (n = 11/27) or spared (n = 25/27) and the absence of seizures in patients with deletion restricted to this gene confirmed that AKT3 was not involved in epilepsy. The difference in the number of epileptic patients with or without ZBTB18 deletion was also not significant (13/23 vs 23/31, p = 0.24). These results suggest that the loss of one HNRNPU allele is the primary cause of epilepsy. Among the seven patients with HNRNPU mutations, six had constitutive de novo mutations and one has a mosaic frameshift mutation (Table 1). All seven mutations (four frameshifts, one nonsense variant and two splice site mutations, Fig. 2b) theoretically introduced a premature termination codon in the protein sequence, a mutation spectrum compatible with HNRNPU haploinsufficiency as the main consequence. Short tonic sz, unilateral clonic, eye blinking + atypical abs. All six patients with constitutive de novo HNRNPU mutations had early-onset epilepsy (Table 1, Table S4). Seizure onset ranged from age 2.5 months to 4 years, and was within or at the first year of life in 5/6 patients. Fever was a factor triggering seizures in five patients. Seizures types included tonic–clonic, tonic, unilateral clonic or atypical absences occurring one to 20 times a day. Two patients experienced status epilepticus. Early developmental delay was observed in all patients, including the individual with the mosaic mutation. The severity of ID ranged from moderate to severe. None of the seven patients was able to make sentences, four of them spoke single words at a time and one never acquired any word. Two patients older than 6 years never learned to walk independently and three others walked after the age of 30 months. Microcephaly was noted in one patient and global hypotonia in three. Among the five patients who underwent brain MRI, one displayed a small splenium of the CC and one had a globally thin CC (Fig. 3). Mutations identified in ZBTB18 included three missense variants altering highly conserved amino acids of the protein (Fig. S4). 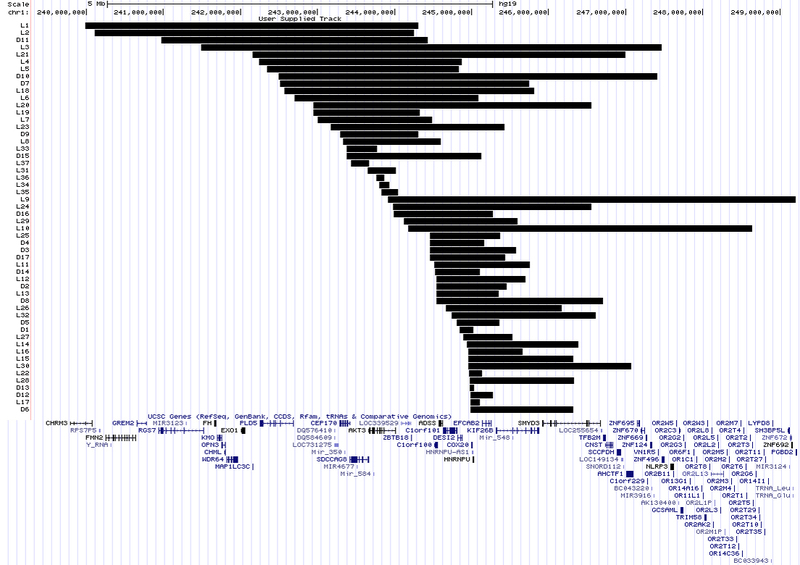 Two of them are located in zinc finger domains in which missense mutations tend to cluster (Fig. 2c). The remaining was a nonsense mutation. Analysis of the parents showed that all variants occurred de novo. All four patients with ZBTB18 mutations had ID ranging from mild to severe (Table 2). All had developmental delay with walking achieved by age 24 months (range 22–27 months). Language abilities were highly variable, with two 12-year-old patients speaking short sentences, one individual being able to read syllables at the same age, and the most severely affected adult patient speaking only a few words. Two patients experienced seizures from the age of 8 months and 9 years. Spells were tonic–clonic seizures and head turning with cyanosis. Epilepsy in the patient with the earliest onset rapidly responded to valproate therapy. The OFC was normal in three patients and borderline in another. AnCC was observed in the three patients who underwent brain MRI, with two having a partial AgCC and the other short CC (size <3rd percentile) classified as a DysCC (Fig. 3). Except one, all patients with 1q43q44 microdeletions or point mutations in ZBTB18 and HNRNPU had developmental delay or ID with a wide range of severity (Tables 1, 2, S2 and S3). The only exception was a patient with a borderline intellectual quotient and a deletion limited to AKT3 (#L31) inherited from his father who was reported to have an intelligence within the normal range (Gai et al. 2015). Since formal evaluations of cognitive functioning were unavailable for most other patients, we used the postural and language milestones to evaluate their developmental level. Walking abilities were available for 22 patients with 1q43q44 deletions older than 2 years. Four of them were unable to walk and 18 walked independently at a mean age of 35 months (median age 24 months). Among ambulatory patients, (1) three had microdeletions encompassing ZBTB18 and AKT3 but not HNRNPU and walked at a mean age of 18 months (range 17–19 months, median age 18 months), (2) 13 with a deletion including HNRNPU but not AKT3 and ZBTB18 walked at a mean age of 32.6 months (range 21–59 months, median age 24 months), and (3) two had a large deletion encompassing the three genes and walked at a mean age of 6.5 years (range 5–7 years). Among non-ambulatory patients, one carried a HNRNPU deletion and the three others had a deletion of the three genes. These data suggest that the loss of one HNRNPU allele has a more deleterious effect on walking acquisition than the loss of ATK3/ZBTB18 genes but larger deletions including all three genes have even more severe consequences. Walking abilities in patients with HNRNPU point mutations were similar to those with deletions of the gene. Patients with ZBTB18 mutations globally walked later than those with deletions including AKT3 and ZBTB18 although this should be confirmed on larger patient series. Language abilities were available for 15 patients with 1q43q44 deletions older than 4 years of our series only. Three patients did not speak any word, six had acquired a few words, six were able to speak short (n = 5) or full (n = 1) sentences. None of the four patients with a deletion of all three genes made sentences, whereas 2/2 patients with deletions including AKT3 and ZBTB18 but not HNRNPU, and 4/10 patients with HNRNPU deletions did. Thus, patients with HNRNPU point mutations globally had more severe speech impairments than patients with deletions including HNRNPU, who had more variable language abilities. Yet, language abilities were more preserved in patients with ZBTB18 point mutations and individuals with deletions including ZBTB18 but sparing HNRNPU, since 6/7 could speak sentences. The association of ID, microcephaly, AnCC and epilepsy characterizes the full neurodevelopmental phenotype of the 1q43q44 microdeletion syndrome. The recent identification of point mutations in ZBTB18 and HNRNPU in patients with neurodevelopmental disability can help decipher genotype/phenotype correlations. In this study, we confirm that AK3, ZBTB18 and HNRNPU are the main genes contributing to the phenotype of the 1q43q44 microdeletion syndrome, with each gene driving a specific feature although genetic interactions between these genes also exist. Microcephaly has been reported in about half of the patients with 1q43q44 deletions. Previous genotype-phenotype correlation studies suggested that microcephaly is mainly associated with AKT3 haploinsufficiency (Ballif et al. 2012; Gai et al. 2015; Nagamani et al. 2012; Thierry et al. 2012). Our data, analyzing the alignment of 49 deletions from patients with known OFC confirmed this correlation. The occurrence of microcephaly in patients with microdeletions restricted to AKT3 (Ballif et al. 2012; Gai et al. 2015; Nagamani et al. 2012) narrows the minimal critical region to this single gene. This observation is consistent with a mirror phenotype consisting in macrocephaly in individuals with duplications encompassing AKT3 and segmental hypertrophy (in the form of hemimegalencephaly or syndromic megalencephaly) in individuals with missense mutations leading to increased mTOR signaling that are usually—but not always—limited to mosaic brain tissues (Fig. 2a) (Conti et al. 2015; Lee et al. 2012; Poduri et al. 2012; Riviere et al. 2012; Wang et al. 2013; Nellist et al. 2015; Takagi et al. 2017). It also confirms that dosage of AKT3 is crucial for controlling brain size during development. The observation of two patients and a healthy father with microdeletions limited to AKT3 and normal brain size (Gai et al. 2015) suggests that AKT3-related microcephaly is not fully penetrant. Alternatively, the fact that AKT3 deletions in patients with normal OFC alter the 3′ end of the gene could suggest that the region of AKT3 critical for microcephaly encompasses at least the first 5 exons but not the 3′ coding part of the gene (Fig. 3a). This hypothesis is compatible with the description of three AKT3 isoforms encoding two distinct proteins differing in their 3′ exons. No patient with constitutive point mutation leading to LoF of AKT3 has been reported so far, so we were unable to compare the phenotype of patients with point mutations and microdeletions; but our data suggest that point mutations resulting in LoF of AKT3, especially if located in the 5′ exons common to the two known AKT3 isoforms, would result in microcephaly with or without ID. The preponderant role of AKT3 in microcephaly does not exclude minor involvement of other genetic determinants. This is exemplified by the observation that: (1) three deletions sparing AKT3 (one encompassing ZBTB18 and HNRNPU and two HNRNPU but not ZBTB18) were also associated with microcephaly, and (2) all patients with deletion comprising AKT3 but extending to and including ZBTB18 and/or HNRNPU had microcephaly. The OFC is known for nine patients with ZBTB18 mutations [from the literature (Table S6) and our series] and three have microcephaly. This observation, combined with the microcephaly phenotype described in Zbtb18 −/− mice, suggests that microcephaly can also be associated with ZBTB18 mutations and deletions with a lower penetrance. In contrast, data from patients with HNRNPU mutations (Tables 1, S5) shows that heterozygous loss of HNRNPU is rarely associated with microcephaly. Therefore, we suggest that: (1) AKT3 haploinsufficiency is sufficient to cause microcephaly with high but incomplete penetrance, (2) the heterozygous loss of ZBTB18 may cause microcephaly with a lower penetrance, and (3) other regions located more distally (including ZBTB18) may contribute to microcephaly in addition to AKT3 deletion. Previous genotype–phenotype correlation studies determined ZBTB18 to be the main candidate gene for AnCC in the 1q43q44 deletion syndrome (Ballif et al. 2012; Nagamani et al. 2012; Thierry et al. 2012). This hypothesis was supported by the analysis of deletion alignments and by the absence of CC in mice lacking both copies of RP58, the murine homologue of ZBTB18 (Xiang et al. 2012). However, the first three patients with heterozygous ZBTB18 mutations were reported to have a normal CC (de Munnik et al. 2014; Lopes et al. 2016; Rauch et al. 2012). This unexpected result has been challenged by the recent report of AnCC in four patients with ZBTB18 de novo mutations (Cohen et al. 2016). Similarly, three of our four patients with ZBTB18 mutations had AnCC. Genotype–phenotype correlations in our series of patients with 1q43q44 deletions confirm that ZBTB18 is the main gene driving AnCC in the 1qter region. However, 5/22 patients with ZBTB18 haploinsufficiency and 4/11 with ZBTB18 point mutations had normal CC, indicating that like for many other genes previously associated with AgCC in humans, the AnCC related to ZBTB18 is not a fully penetrant trait. Interestingly, most ZBTB18 point mutations are truncating or located in the functional zinc-finger domain of the ZBTB18 protein. This mutation spectrum suggests that missense mutations could also lead to a LoF of ZBTB18, although this has to be confirmed by functional studies. Considering different categories of AnCC, it appeared that: (1) no patient with 1q43q44 deletion sparing ZBTB18 had AgCC, (2) three patients carrying HNRNPU deletions sparing ZBTB18 and two with HNRNPU point mutations had ThCC (one had DysCC), and (3) patients with ZBTB18 point mutations had either partial AgCC, DysCC or ThCC. Thus, ThCC is the main category of AnCC observed when HNRNPU is deleted and is possibly related to insufficient myelination of crossing axons rather than indicating malformation of the CC. We conclude that ZBTB18 haploinsufficiency predisposes to different types of AnCC, particularly partial AgCC, while HNRNPU anomalies are more specifically associated with ThCC. Furthermore, AgCC is significantly more frequent in patients with microdeletions comprising ZBTB18 extending towards the telomeric end of the 1q region, i.e., encompassing both ZBTB18 and HNRNPU, compared to those encompassing ZBTB18 but sparing HNRNPU. This suggests that the loss of genetic determinant(s) in 3′ of the ZBTB18 coding sequence or that the co-deletion of ZBTB18 and HNRNPU has an additive effect resulting in AgCC. Moreover, the AgCC observed in patients with point mutations or small deletions altering mainly ZBTB18 is partial and characterized by a small splenium with the absence of beak (patients #Z1 and #Z4 and #2, #3 and #5 in Cohen et al. 2016). However, complete or subtotal AgCC have been reported in patients with larger 1q deletions not included in our study (Boland et al. 2007; Caliebe et al. 2010; Hemming et al. 2016; Zaki et al. 2012), suggesting that one or more proximal genes on chromosome 1 could also lead or predispose to AgCC. Two thirds of patients with 1q43q44 deletions have epilepsy. The minimal critical region for epilepsy included HNRNPU and COX20. COX20 encodes a protein contributing to the assembly of mitochondrial cytochrome C oxidase and has been involved in a recessive disease with healthy heterozygous carriers (Doss et al. 2014; Szklarczyk et al. 2013). Thus, heterozygous deletions of COX20 are unlikely to be responsible for the epilepsy phenotype. HNRNPU is the main gene accounting for seizures since: (1) epilepsy is present in 90% of patients with deletions comprising HNRNPU and absent in 14/15 patients with deletions sparing HNRNPU, and (2) all patients with constitutive HNRNPU mutations have epilepsy. The only epileptic patient with a deletion sparing HNRNPU had a deletion encompassing ZBTB18. Given that 3/11 patients with ZBTB18 mutations, including two of our series, had seizures; epilepsy may also be a minor phenotypic trait in some patients with ZBTB18 haploinsufficiency. The pro-epileptogenic effect of ZBTB18 alteration could be masked by the strong penetrance of HNRNPU-related epilepsy in patients with loss of both genes. The mean age at seizure onset in patients with HNRNPU point mutations from both our series and the literature (n = 9) was 13.5 months (median 8.5 months), versus 12.3 months (median 12 months) in individuals with deletions encompassing HNRNPU but sparing ZBTB18 (n = 13) and 12.9 months (median 12 months) in patients with deletions encompassing both HNRNPU and ZBTB18 (n = 7). These observations suggest that the age at seizure onset is independent of the size of the deletion, and that the loss of one HNRNPU allele is the strongest factor determining the age at seizure onset. To date, available data did not reveal specific epileptic features in patients with HNRNPU mutations or deletions. Tonic–clonic seizures and atypical absences are the most frequently reported seizure types. Seizures occur with variable frequencies, are frequently triggered by fever at the onset of the disease and are pharmacoresistant in some patients. Diffuse or focal slow-waves or a slow background activity are recurrently reported on EEG recordings together with various epileptiform features. ID is reported in almost all patients carrying 1q43q44 deletions, but its severity is frequently unmentioned. The only individuals without ID had a deletion limited to the whole AKT3 gene (Gai et al. 2015). The cognitive abilities of other patients with microdeletions limited to AKT3 are unknown but at least two of them were reported to have ID (Nagamani et al. 2012). All patients with ZBTB18 mutations known to date have ID with variable degrees of severity, except one with “overall cognitive ability in the low average range” (Cohen et al. 2016). In contrast, no patients with HNRNPU mutation or with HNRNPU deletion and normal development have been reported. Patients with ZBTB18 mutations from the literature walked at a mean age of 28 months (n = 8) and 5/8 of them aged 3–37 years were not able to speak sentences or to associate several words. Thus, the impression of a relatively preserved development in patients with ZBTB18 mutations from our series should probably be attenuated. These differences are apparently unrelated to the nature (missense versus truncating) of the mutation but likely to the small sample sizes. An overview of acquired developmental milestones in these series of patients shows that those with HNRNPU deletions or mutations have a globally more severe postural and speech delay that those with AKT3/ZBTB18 deletions and those with ZBTB18 mutations. Because the most severe group of patients have deletions encompassing HNRNPU, AKT3 and ZBTB18, co-deletions of these three genes could have an additive detrimental effect on neurodevelopment. In conclusion, the complete neurodevelopmental phenotype of the 1q43q44 microdeletion syndrome is the consequence of the deletion of three main genes spanning 1.36 Mb. Our data confirm that AKT3 is the main gene driving microcephaly, ZBTB18 defect is responsible for AnCC and HNRNPU is the main gene accounting for epilepsy. These correlations can be summarized as follows: (1) AKT3 deletion causes microcephaly with incomplete penetrance but ZBTB18 and HNRNPU deletions may also be involved with a weaker effect; (2) epilepsy and the loss of one HNRNPU allele are strongly associated; and (3) AgCC, is dependent on the loss of ZBTB18 allele but is also influenced by the alteration of neighboring genes. Neurodevelopmental impairment in patients with ZBTB18 LoF is more variable and less severe than that with HNRNPU LoF. 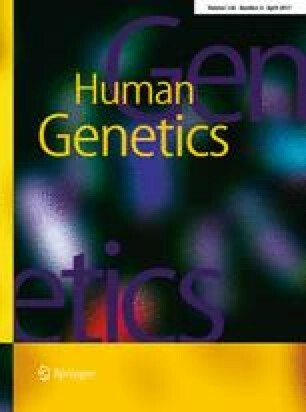 Additional studies are required to investigate factors controlling this phenotypic variability in more details, including in particular the possibility of modifiers variants located on the trans allele. The authors thank the families for their participation in this study and the Paris-Descartes Bioinformatics Platform for access to the Polyweb interface. This study makes use of data generated by the DECIPHER community. A full list of centres who contributed to the generation of the data is available from http://decipher.sanger.ac.uk and via email from decipher@sanger.ac.uk. Funding for the project was provided by the Wellcome Trust. The DDD study presents independent research commissioned by the HealthInnovation Challenge Fund (Grant Number HICF-1009-003), a parallel funding partnership between the Wellcome Trust and the Department of Health, and the Wellcome Trust Sanger Institute (Grant numberWT098051). The views expressed in this publication are those of the author(s) and not necessarily those of the Wellcome Trust or the Department of Health. The study has UK Research Ethics Committee approval (10/H0305/83, granted by the Cambridge South REC, and GEN/284/12 granted by the Republic of Ireland REC). The research team acknowledges the support of the National Institute for Health Research, through the Comprehensive Clinical Research Network. This study was financially supported by the Assistance Publique des Hôpitaux de Paris (AP-HP), PHRC (no PO81260), INSERM, Fondation Maladies Rares, Fondation de France (FdF—Engt no 15144), Agence de la Biomédecine, Agence Nationale de la Recherche (ANR Blanc CILAXCAL), and the “Investissements d’Avenir” programme ANR-10-IAIHU-06 (IHU-A-ICM). Dr Solveig Heide was supported by a master grant from the Fondation pour la Recherche Médicale (FRM). CD and CN are members of the Biopsy labex. The study received approval from local ethical standards committees on human experimentation. Informed written consent was obtained from each individual or their parents or legal representatives before blood sampling.